This year’s Women’s March, set to happen on Saturday in cities across the country, has become extraordinarily messy. In 2017, the marches that took place in Washington and nationwide — the largest protests in American history — were radiant symbols of hope and resistance at a bleak, terrifying historical juncture. Two years later, the Women’s March organization has become a depressing study in how left-wing movements so often implode in the digital age. 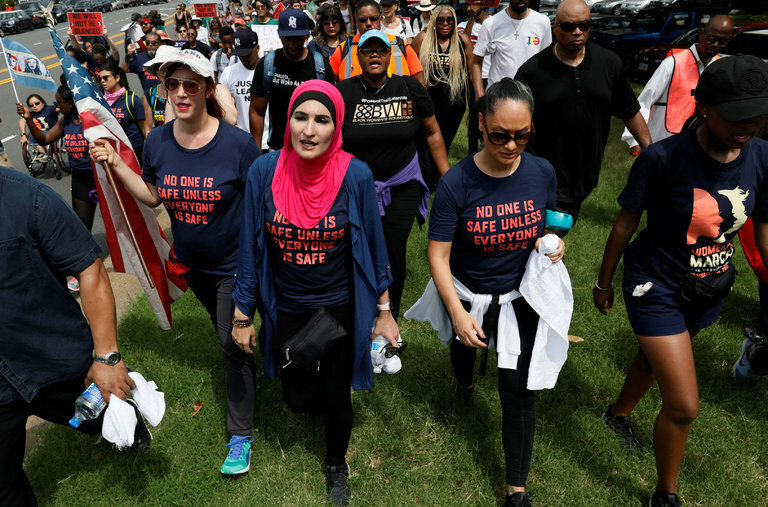 Serious allegations of anti-Semitism have dogged some of the Women’s March’s leaders for over a year, but they’ve lately reached a crisis point. In December, Tablet Magazine published a 10,000-word article about anti-Jewish bigotry (as well as alleged financial mismanagement) among the Women’s March’s leadership. Many Jewish women have publicly agonized about joining this year’s demonstration. Following that interview, the Democratic National Committee, which had been listed as a partner of the 2019 march, appeared to pull out, the latest sign that the Women’s March has made itself toxic in center-left circles. Several groups that have sponsored the march in the past, including Naral and the Southern Poverty Law Center, are also gone from its public list of backers. Local marches around the country have emphasized their independence from the national Women’s March organization. New York City will have two competing rallies, a tangible symbol of feminist divisions. Yet even if you’re willing to accept rationalizations for associating with an anti-Semite, the point of organizing is to build political power, and in that respect the leaders of the Women’s March have pretty clearly fallen short. They were put at the helm of a popular mass movement, and under their leadership it has alienated many supporters and become significantly more marginal. In certain ways, their failure recapitulates an old, sad story: Though African-Americans and Jews worked in solidarity during the civil rights era, there were always tensions, and they got worse as the civil rights movement fractured. Part of what went wrong with the Women’s March, however, seems specific to our time, when the internet has transformed activism. The idea for a women’s march on Washington was born in viral Facebook posts that Bob Bland, one of the current co-chairwomen, and Teresa Shook, a retired lawyer in Hawaii, put up after the 2016 election. On social media, tens of thousands of women committed to travel to Washington before any logistical arrangements had been made. Some of the women making initial preparations realized it would be a disaster if the march seemed to be entirely by and for white women. So, at the suggestion of a celebrity-connected activist named Michael Skolnik, Mallory and Perez, both affiliated with Skolnik’s nonprofit, the Gathering for Justice, were recruited to help lead it. They, in turn, brought in Sarsour. Mallory, Bland, Sarsour and Perez were part of a group that labored heroically to put the first Women’s March together in just 10 weeks. But there’s no reason to think that the millions of people who took to the streets that day saw any of them as their representatives, or bought into some of the radical positions they’d go on to take. (In 2017, for example, Sarsour, going beyond a defense of anti-Zionism, claimed that Zionism and feminism are irreconcilable.) Because the Women’s March was never a membership organization, there was no obvious way for those who felt aligned with it to help decide who should carry its banner forward. The Women’s March ultimately faced a problem endemic to protest movements that organize spontaneously on the internet, going back to Occupy Wall Street. As Zeynep Tufekci argued in her 2017 book “Twitter and Tear Gas: The Power and Fragility of Networked Protest,” mass protest once required deep, sustained organizing, with all the compromise and human connection that entailed. The process of putting a major demonstration together would itself allow strong leaders to come to the fore. Digital organizing makes much of that work obsolete. As a result, people are often left trying to create a movement after a high-profile action, rather than before it, without clear common goals or leaders who have broadly accepted legitimacy. So while the Women’s March leaders failed in very particular ways, it’s not clear that anyone could have succeeded in their place. Two years ago they helped create something magnificent. The exhilarating energy of the 2017 march went on to fuel countless local Resistance groups that worked because they were organized face-to-face and had definable, practical aims. It’s painful to see the Women’s March fall apart now, but maybe it was always destined to be a moment instead of a movement. Previous articleI Put My Baby Daughter in Dinosaur Overalls. Am I an Anarchist?